You are da man, Sam! 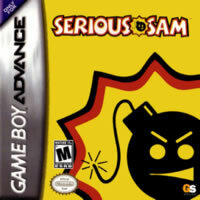 While my experiences with the games in the Serious Sam franchise have all differed greatly, I have to admit that for what it sets out to do the Game Boy Advance port of Serious Sam is quite ambitious. Sometimes, however, ambition brings with it a unique (and shall we say serious?) set of challenges in game design and implementation. What I said for Duke Nukem Advance can pretty much be copied wholesale for Serious Sam Advance — but I will try to find something new to say. This game is very faithful to the core Serious Sam experience. There is an abundance of weapons and ammunition and swarms of enemies to kill with said tools. 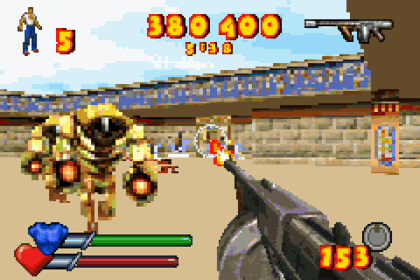 All of these elements are lifted straight from Serious Sam, and the environments are themed like those from the series, with the previously established time travel vibe. 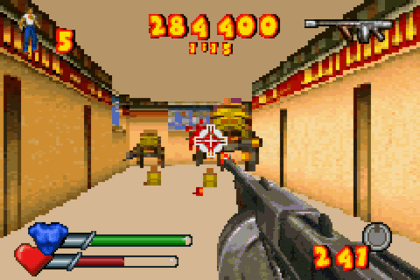 The levels are mostly closed in corridors and small rooms (which goes against the large open areas with strafing room typically in Serious Sam) but are skinned in the style of the games. The large number of small rooms and corridors are likely a result of the platform's limitations, so I really can't pick that up as much of a fault, instead simply an example of how parity cannot be fully achieved when porting a PC game to a handheld. Still, that said, the strafing is easy to do and comfortable, with the shoulder buttons strafing left and right respectively. It's trickier to strafe around an enemy than it is on PC because the mouse and keyboard combination is far more suited to that kind of movement. However, you can instead simply strafe left and right to avoid fire, so the functionality is still there it just takes some getting used to its nuances. The game's plot goes by far too quickly to be read, and offers no real substance of any kind. Time travel, artifacts, the return of Mental... it sounds exactly like it is, a tacked on spin-off with no contextual or canonical importance. I got 'em runnin' scared now! The game chugs and chugs until there is nothing left in the whiskey barrel as the graphics then stumble out of the saloon doors and onto a train track. That postage stamp-sized GBA screen blends all the colours together into a gloopy mess. It's not as dire a job as the GBA version of Crazy Taxi, but when a game runs this bad and looks this bad, there's just no hope for it. Once you're used to the primitive framerate and embarrassing lack of polish, there are moments of joy to be had. Perhaps at a time where the Game Boy Advance was the top handheld (and I guess there was an audience for a portable Serious Sam?) this would have filled the void. But these days, your GP32s and tablets and mobile phones could run of a source port at a relatively high speed. Props go to Climax Studios for their valiant attempt, though. I would say this game is for fans of the series only, and was most definitely a product of its time. I would hardly recommend it these days, but I imagine it made some kids happy back when it came out. Easily impressed kids.